If you are using a Windows laptop, you must be familiar with the Power Plans feature of Windows. You can switch to different power plans in order of performance. The use of power plans efficiently makes the battery last longer. There are three default power plans in Windows, Maximum Performance, Balanced and Power Saver. Power Saver makes the computer use less battery by compromising on performance while balanced keeps a balance between power consumption and performance. Maximum performance plan does not limit any kind of resource usage on the laptop. Full Throttle is a program which enables the maximum performance mode for selected applications only. For all other apps, the default mode remains activated. Previously I was using utilities like Boray Power which automatically switches to power saver mode if the laptop is inactive for a specific period of time. And Power Plan Assistant which gives you a lot of options when configuring the power plan of your choice. Full Throttle goes a little further by activating maximum performance plan for specific programs only. The programs are user selectable. 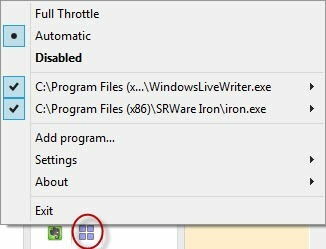 Using Full Throttle is quite simple as it resides in the system tray all the time. I wonder why it comes as a self installing app while it only weighs 112 KB. The setup is very fast and after the setup, Full Throttle will automatically rest in the system tray. Adding new programs to Full Throttle is very easy. Just right click the system tray icon and select “Add program…”. This will open the file selection dialog where you can select the executable of the program which you want to run in full performance mode. After you have selected you first program, you will see that your selected power plan will be changed to high performance but this mode will only be used for selected applications. All other programs and apps will remain in the previous power plan. One thing to take care is that if you are operating in a hot environment, turning on maximum performance mode will result in the rise in operating temperatures of the laptop. Since I work in a hot environment, I keep the power plan to power saver which consumes less energy and the laptop does not get heated up soon. What do you do to use your laptop battery life efficiently?